The 1970s Diet: Freedom for Tooting! 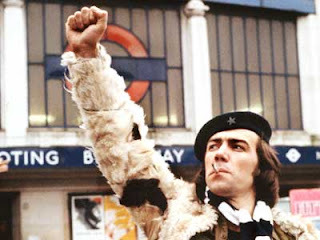 And "power to the people" were the catch phrases of Citizen Smith the 1977 BBC comedy series starring Robert Lindsey. He played the character of "wolfie" who wanted to be a revolutionary like his hero Che Guevara but not in Cuba in Tooting, South London of all places! http://en.wikipedia.org/wiki/Citizen_Smith.%20I thought of this today when my daughter aged 5 said "the teachers have gone bowling haven't they mummy?" - the may all be in their local bowling alley for all I know but she was, of course, referring to today's public sector strikes. I, for one, support them 100%. Why should they roll over and accept the latest offerings from this piss poor government? I wouldn't want my 5 year old to be taught by a 68 year old teacher would you? Isn't there enough young unemployed in this country (hiding in the student statistics - they were all shipped off to university so they can go undercover for a few more years). The unions fought hard for workers to have rights - they made sure we got paid holidays way back when. You'll probably be aware by now that my leanings are very much left if not verging on Communism (okay maybe not quite but the principle is sound and christian isn't it?). I dislike the Tories immensely - granted all politicians on either side are all in it for themselves but this lot more so. David Cameron's lot are playing at being in power and will soon get bored and go back to their luxurious lifestyles. I hated Thatcher but he's really giving her a run for her money. We all remember when she took our free milk in primary school, sold council houses so now we have a desperate shortage of social housing. He is shutting public libraries and Surestart Centers. I mean I could go on and on and on but I won't as I have dieting to do and must remain focused at all times. Today the kids are off, its all a bit hectic, my eldest son is in a strop over his haircut being way too short and the house is a tip. So I'm off to tidy and get in a bit of Wii dancing - I am aiming to be in the 12 stone region by Xmas its a tall order (8lbs) but one which isn't mission impossible. Love the picture, but actually I wouldn't mind my kids being taught by a 68 year old if he or she was a really good teacher and wanted to be still teaching. Just saying. Hi, thanks. How many in real terms would really want to be teaching when they're fast approaching 70? The teachers I have spoken to don't want to and I think at that stage they'd be a bit jaded and lack energy for things like PE - give the young jobs not make people work till they're nearly 70. Just saying!